If you’re like 88% of Americans, chances are you don’t think twice about where you buy your gas, as long as it’s cheap, convenient, and offers super-sized drinks for all of 69 cents. And that’s a big-time problem these days. Gas stations are all about price and volume, and cheap sells. Unfortunately, when it comes to most modern cars, using cheap off-brand gasoline can also cause expensive problems -- the kind that can be chronic, and deadly for your car's engine. Here in the United States, engines are now experiencing higher levels of failure -- along with more fuel related issues -- than they were just a few years ago. That means that your reliability is getting worse... but the manufacturers who designed your engines aren't the ones to blame. You are, if you're still using cheap gas. Wait -- is this every engine? No. It's just for cars with what's called gasoline direct injection, or GDI. That amounts to nearly half of all new cars and trucks. 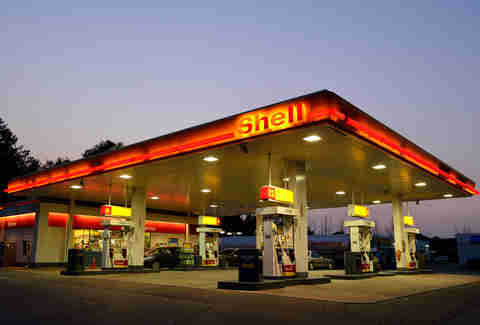 If you look at the photo above, you can see gasoline getting injected directly into the cylinder, hence the name. Without getting too technical, it's a different way of mixing the air and fuel to optimize your engine. The science behind it is a bit complicated, but the results are easy to understand: up to a 15% gain in fuel economy, 30-50% more low end torque (the power you feel off the light), reduced long term wear from cold starts, and 30-50% fewer emissions than their conventional counterparts. The truth is that these engines can be just as reliable and far better to own than their non-GDI alternatives, provided you use Top Tier gas (more on that in just a second) instead of the cheap stuff. How important is gas quality? I checked with Rebecca Monroe, Senior Fuels Engineer at General Motors, who told me "proper gasoline detergency is necessary for keeping engine components free of deposits in direct injection engines." In other words, Top Tier gas contains a lot of additives and detergents designed specifically to keep a DI engine clean, in good working order, and reduce the quantity of fuel deposits. 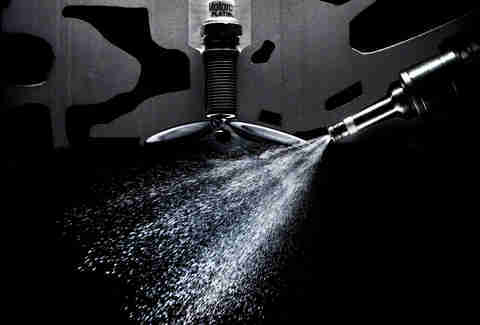 Direct injection engines are very sensitive to the fuel you use. This isn't just some theory. Here's proof of what's going on. 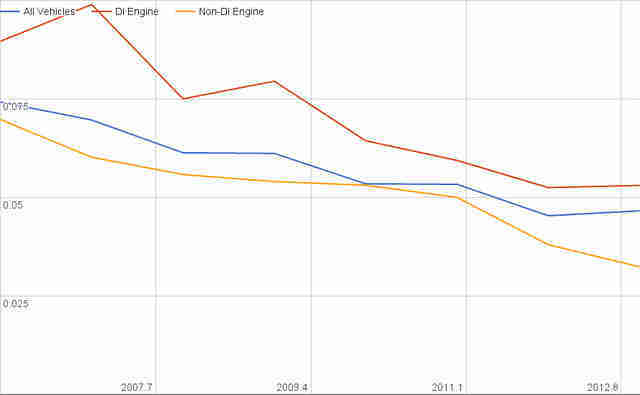 If you look at this graph, you'll see a statistically significant difference in the frequency of engine issues between cars with GDI, and those without. This data is from a study I co-developed, called the Long-Term Quality Index, which over the past three years has compiled over a million trade-in inspections throughout the United States. Basically it's a huge database of engine and transmission issues. You see those sudden declines in reliability? Each one represents a different car switching over to GDI. Combine what you know about the effect of cheap off-brand gas in a DI engine with what you know about the average American's gas-buying habit and this obvious trend and you've got a convincing argument as to the cause of the reliability problems: your own cheapskatedness. Use Top Tier gas if you have a direct injection engine. Period. A bunch of manufacturers got together and developed a performance standard for gasoline called Top Tier. Dozens of retailers, from Amoco to Valero, get their gasoline additive packages inspected for their ability to keep your engine clean and free of metal contaminants. A recent scientific experiment conducted by the American Automobile Association, yielded some pretty clear-cut results. When comparing Top Tier with non-top tier gasses in a controlled environment, "non-TOP TIER gasolines caused 19 times more engine deposits than TOP TIER brands after just 4,000 miles" (emphasis added). Remember, it's about brands -- not octane levels -- so unless your car specifically calls for premium, you can get the lowest grade so long as it's from an approved brand. The cost difference between Top Tier gas and the cheaper stuff averages out to only three cents, but the impact on a direct-injection engine is simply enormous. This is a no-brainer, people. You can find the list of gas retailers here. There are over 40 to choose from. Won't the expensive gas cost more than repairs? Nope. Not even remotely close. Assuming you drive your car for 100,000 miles and average 25mpg, you’re only really saving $120... before taking in the real expenses to your bottom line. Because the cheap gas can gradually destroy far more expensive parts of your engine, be prepared to replace things like injectors, which can cost anywhere between $500 to over $1,000 to have replaced. Some have tried everything from chemical cleaners to blasting the valves with walnut shells (really!). These treatments cost around $400 to $600 and often times they’re too little, too late, and well after the warranty period. If you use Top Tier gas and follow the maintenance schedule, a direct injection engine can potentially save you well over $1,000 in fuel savings and greatly improve every aspect of your driving experience compared to a non-DI engine. So do yourself and anyone that owns your car after you a favor: invest in your vehicle and keep those walnut shells in the trash where they belong. Steven Lang is an auto auctioneer, car dealer, and former part-owner of an auto auction near Atlanta, Georgia. 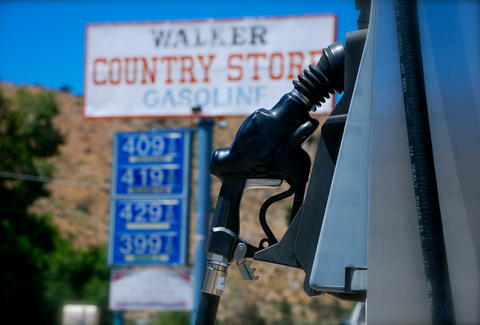 He strives to be cheap, but not when it comes to gasoline. Feel free to reach him directly at his Facebook page.